Then the cook sent three servants after them, who were to run and overtake the children. 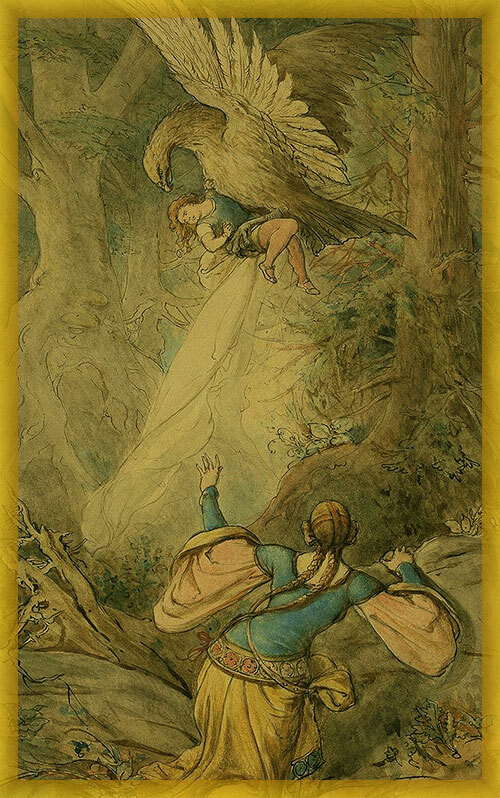 The children, however, were sitting outside the forest, and when they saw from afar the three servants running, Lina said to Fundevogel: 'Never leave me, and I will never leave you.' Fundevogel said: 'Neither now, nor ever.' Then said Lina: 'Do you become a rose-tree, and I the rose upon it.' When the three servants came to the forest, nothing was there but a rose-tree and one rose on it, but the children were nowhere. Then said they: 'There is nothing to be done here,' and they went home and told the cook that they had seen nothing in the forest but a little rose-bush with one rose on it. Then the old cook scolded and said: 'You simpletons, you should have cut the rose-bush in two, and have broken off the rose and brought it home with you; go, and do it at once.' They had therefore to go out and look for the second time. The children, however, saw them coming from a distance. Then Lina said: 'Fundevogel, never leave me, and I will never leave you.' Fundevogel said: 'Neither now; nor ever.' Said Lina: 'Then do you become a church, and I'll be the chandelier in it.' So when the three servants came, nothing was there but a church, with a chandelier in it. They said therefore to each other: 'What can we do here, let us go home.' When they got home, the cook asked if they had not found them; so they said no, they had found nothing but a church, and there was a chandelier in it. And the cook scolded them and said: 'You fools! why did you not pull the church to pieces, and bring the chandelier home with you?' And now the old cook herself got on her legs, and went with the three servants in pursuit of the children. The children, however, saw from afar that the three servants were coming, and the cook waddling after them. Then said Lina: 'Fundevogel, never leave me, and I will never leave you.' Then said Fundevogel: 'Neither now, nor ever.' Said Lina: 'Be a fishpond, and I will be the duck upon it.' The cook, however, came up to them, and when she saw the pond she lay down by it, and was about to drink it up. But the duck swam quickly to her, seized her head in its beak and drew her into the water, and there the old witch had to drown. Then the children went home together, and were heartily delighted, and if they have not died, they are living still.